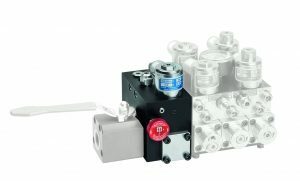 L20 Description: The L20 Pressure Lock Valve is a solenoid operated check valve designed for hydraulic elevators and includes a self-closing manual lowering valve. Its purpose is to allow free flow of oil from the pump unit to the cylinder for upward travel and to prevent flow in the reverse direction from the cylinder to pump until an electrical signal is given to its solenoid. The L20 is to be directly mounted on a Blain EV ¾” valve at the cylinder port without the need of any adapters. It can be either used as a standalone safety valve by docking on an existing Blain EV valve with separate tank line (for modernizing old installations) or can be used as an integrated safety valve together with Blain’s EVL valve without the need of separate tank connection. Installed in the main cylinder line directly integrated with the main elevator control valve, the L20 can be employed as a safety back up valve to the down system of the main control valve to prevent unwanted down movement of the elevator should an electrical or mechanical malfunction occur in the main control valve (UCM case). A Slack Rope Valve LK for roped elevators (e.g. 2:1 indirect transmission) is optional. It prevents the slack rope condition caused by the lowering of the ram when the car is suspended in the safeties or resting on the buffers.